Sometimes, it's time for us to shut up and let our customers do the talking. Scroll down and read some of the lovely stuff our customers have been kind enough to share about our products. 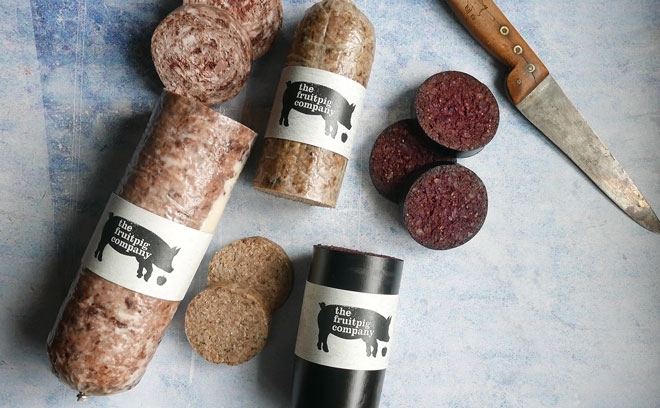 If our fresh blood black pudding, bacons and free-from range of products inspire you to leave a review, we'd be delighted. Black Pudding in Lancashire I recently reviewed your website following my watching an old episode of Jamie's Friday Night Feasts. I was keen to try your real blood black pudding and was delighted to see that Tom Wood was based in Blackburn near to where I live, and stocks your product. I bought some black pudding this weekend and felt compelled to drop you a line to say that my husband and myself are totally converted. It was superb and could not be more different to any product we have previously tasted!!! It was a delight to find your website and subsequently Tom's market stall. Mighty White Like every Fruit Pig product that I've sampled, this is exceptional; no ordinary white pudding this. In every sense this is a magisterial pudding - full of flavour and a wonderful texture. Outstanding produce. Yum! We absolutely love everything about Fruitpig. 5 star all the way. Simply the best This is quite simple luv the best black pudding I’ve ever tasted. I keep the freezer stocked! GF Black pudding Love it! Tastes so good and I use it instead of naan with my curry ?? White Pudding Love this, reminds of Scottish 'mealie pudding' Great flavour and texture, not like a lot of liquidy shop bought white puddings which are pretty tasteless. Just ordered some more! Best black pudding ever Having tried black pudding from everywhere l have never found a taste that replicated what l remembered from childhood days in Leicesteshire. Now l have. Fruit Pig make the best black pudding. If you want the real thing you must try this. Black Pudding There are many British Black Puddings and I have eaten most of them; Stornoway is good, Bury is quite nice but, none of those approach the soft, delightful creamy joy of the Fruitpig Black Pudding. Further more, if you considered Gluten Free a bit of a fad; try the GF Black Pudding, you can practically pour it over your cereal it's so creamy. Just mind with the cooking! Black pudding is already boiled when you get it so a couple of minutes on each side grilled or fried and you are done. even on thick slices. 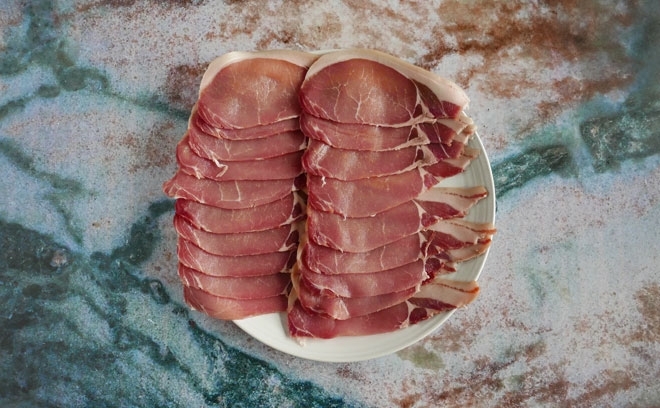 Over cook it and you have thick slab of MEAT (still superior to most BPs mind) but if you cook it just to crisp the top and bottom then the texture and taste are so good you might just consider taking up Vampirism for a neat fix of the good stuff. Black pudding Absolutely delicious! I came across Fruit Pig fresh blood black pudding some time ago and was really taken by the difference in flavour. Other commercial black pudding that you can buy has a dry mealy taste, but this has a light and bright flavour that is almost perfumed. It freezes well and keeps nicely. My wife is not a fan of black pudding. What a shame! All the more for me! A true Haggis I bought a haggis from Fruit Pig at North Creake Farmers Market last Saturday (4 Aug 18). 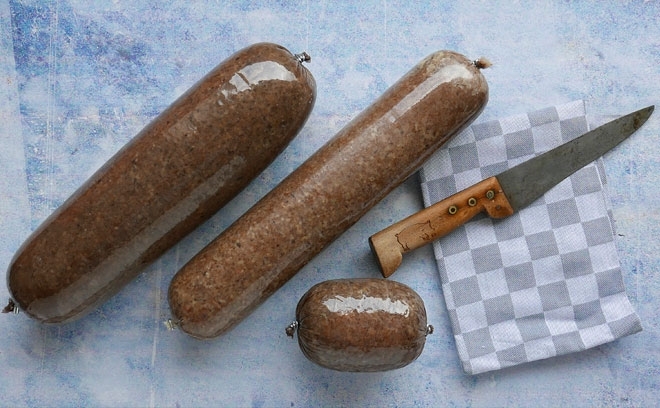 I have always liked haggis but many today are very greasy, not yours. Fruit Pig haggis looked and tasted much meatier than other haggis I've eaten. It had a wonderful peppery tang and the meat content was succulent and flavourful. This is a true Haggis! Yeah, proper bacon We eat this every weekend, old school big breakfast. LCHF. 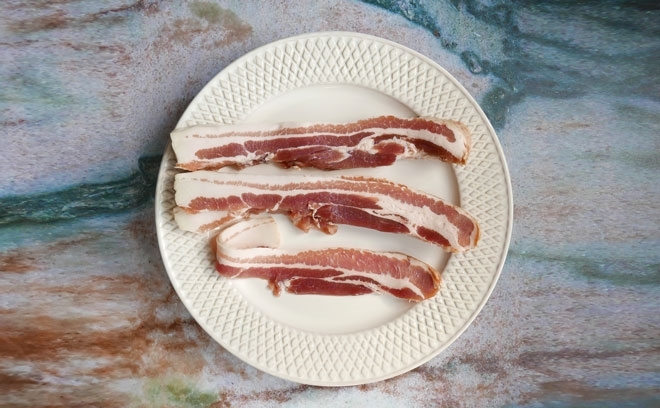 Amazing bacon, my husband eats so much that nitrate free made sense. No water or white bubbles come out of this when you cook it, just lovely fat, that i keep and use to cook everything else. Great flavour This is amazing, really smooth, no grainyness. Fresh is the best. problem is i now have such high standards! Freezer always full of this! OMG the smell..... Wow, what an amazing product, I cooked up a huge batch and froze as slices, a real easy go to for breakfast with an egg on top. Truely awesome. 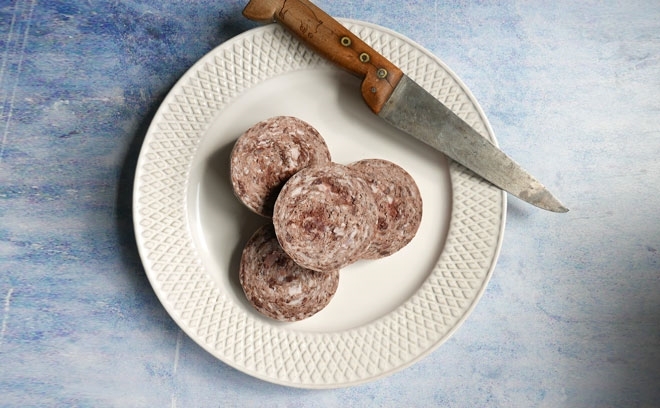 Black Pudding Nostalgia! I'd given up buying modern black puddings, as they were universally bland and a pale imitation of he puddings of my youth. That was until I read an article explaining why they were so tasteless. 95% of puddings are now made with imported, dried pig's blood. I then discovered the Fruit Pig and received my first order last week - black puddings, morcilla and the intriguing 'mutton bacon'! My first recipe was for black pudding Scotch Eggs (River Cottage recipe). An absolute delight and also enjoyed by my carnivorous partner (steak tartare with raw egg type of lady!) and importantly by my 92 year old mother (a tripe and onions type of lady). She declared them to be as good as they used to be. Not yet tried the morcilla or 'bacon', but will definitely order more puddings. You've got to try this! 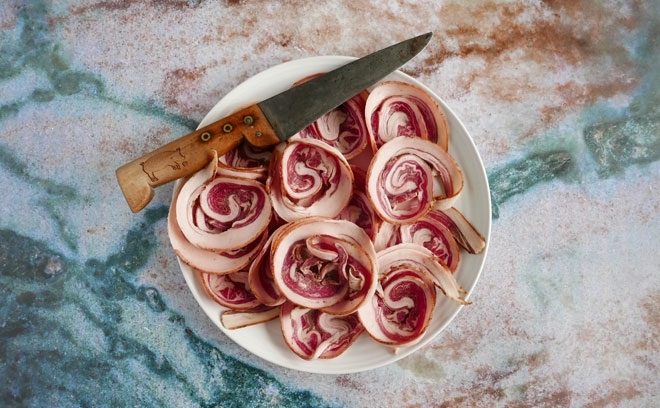 Mutton Pancetta - wha? Try it. You won't be disappointed. It adds a bit of pizzazz to many a meal! 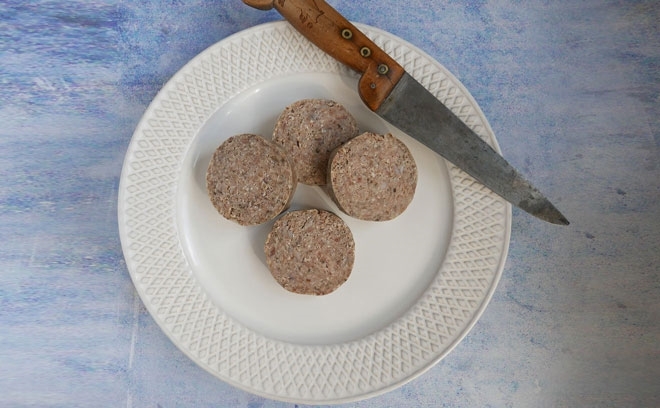 White pudding is a revelation Didn't know white pudding was a thing until we tried in the selection pack. It's really very, very good. From a Lancashire Lad I grew up in Lancashire in the 1950s and 60s and one of my early memories is of Oldham’s Tommyfield Market, a genuine old fashioned outdoor market. There were several stalls that sold black pudding and it was a common sight to see people eating it as they walked around the market. It had an almost creamy texture and was not over seasoned. 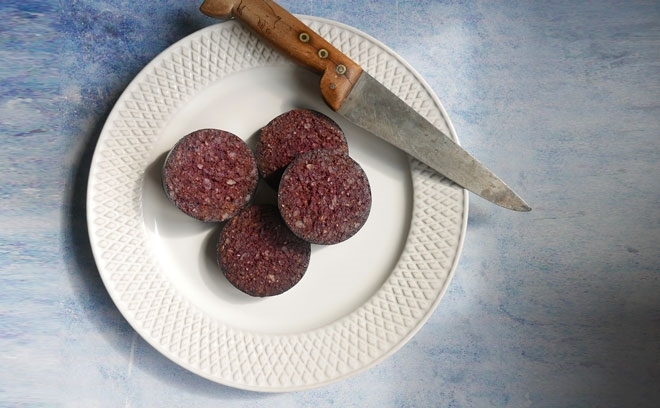 Today’s black puddings, even the so called ‘Award Winning’ ones, are a pale shadow of that, I suspect because of food safety laws that mean most black pudding is produced from blood powder that comes from so many sources that nobody can attest to its provenance. 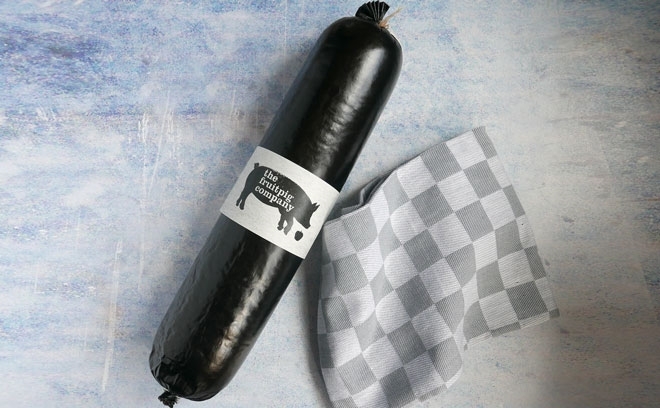 The Fruit Pig Fresh Blood Black Pudding is, without doubt, the best I have ever tasted by a country mile. It has that creamy texture I remember along with a taste that just bursts with flavour without having any one key ingredient dominating. If you love good food you really must try this black pudding: you will not regret it, I promise. Black pudding bonbon heaven I have never tasted a black pudding like it- fantastic...this is not like any black pudding you've ever tasted. Even if you think you don't like black pudding you have to try this one. Delicious Incredibly good. I usually like my Irish puds, mostly oatmeal, minimal meat taste; but for a traditional crumbly English pudding this is by far the best I've ever tasted. Surprisingly sophisticated and powerful flavours. Brilliant stuff. Mouth watering anticipation. Black pudding bonbon heaven I have never tasted a black pudding like it fantastic. I've not been a big lover of the black pudding but this is not like any black pudding you've ever tasted. Even if you think you don't like black pudding you have to try this one. Amazing... amazing.... amazing Nothing compares to this..thank god for Fruit Pig...the king of black pudding...will be back for more and we're spreading the word! What have I been eating all these years? Simply the BEST. If you think you like Black Puddings...try the real thing. What have I been eating all these years?...These are far beyond any other Black Pudding I've had. Soft, moist, with subtle hints of spice..very Moorish indeed. Unreal... This is something else. Soft, moist, with a hint of fruit and pepper and a delicate aftertaste leaving me wanting more. In a very small way it reminded me of haggis? Sorry if this haggis reference offends anyone, but this black pudding needs to be tried by all. Wow I am now a true convert to Real Blood Black Pudding. It is exceptionally tasty, crumbly not fatty and with the real amount of spices. It shows by using all local items we can make a better product than a mass-produced one. Fresh black pudding My fresh black pudding arrived today-not disappointed, the best I've tried and I've tried a lot will definitely be buying more. Anger turns to pleasure Well, I saw the tv show and at 70 years of age, having enjoyed black pudding all my life, I could not believe it was probably not being made with local produce and real blood. To hear it was made with imported dried blood...made my blood boil (forgive the pun). So I purchased the real thing...and have discovered quite simply the best black pudding I have ever eaten. A lovely blend of herbs and spices with a gentle peppery finish. Smooth, juicy and full bodied, it really is a quality product. Needless to say, I have ordered some more from the boys at Fruit Pig. Highly recommended. Delicious This Black Pudding is Fantastic. Full of flavour and so Juicy! Not only do our customers love it, but more importantly I get to eat it whenever I want, which is all the time. Definitely superior We do breakfasts in our village hall on the first Sunday of every month, where we often serve more than 80, and have tried several different black puddings over the last 2 years. We served yours last Sunday and everyone said that it was definitely the best. 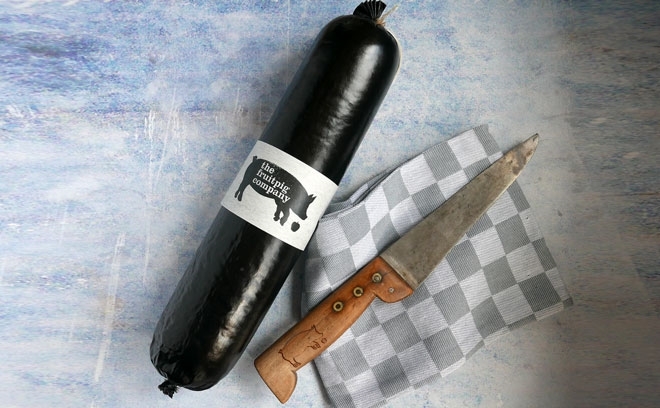 We have tried many different black puddings, in particular from Scotland and Cumbria, but yours surpassed them all. Since doing breakfasts our sales of black pudding have soared, I expect because many people had never tried it before, or perhaps had eaten nasty cheap versions, and did not realise how good it can be. I work in the kitchen and us cooks and washer uppers were especially lucky as we were able to eat many small pieces of black pudding throughout the morning - and that was before we all sat down to our large breakfast. So, you are definitely onto a winner. 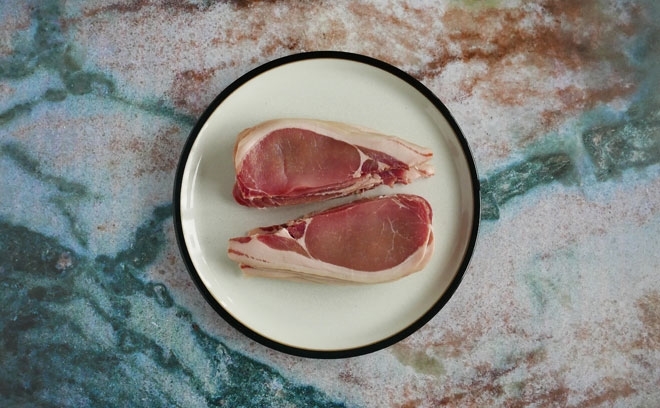 Fruit Pig Company - Rare Breed Pancetta-wrapped, Stuffed Tenderloin Ordered two recently, one as per your recipe and one stuffed with your black pud recipe. Served four good eaters and finished it cold with cheese and pickles next day. Delicious and dead easy to cook as its fully prepared. 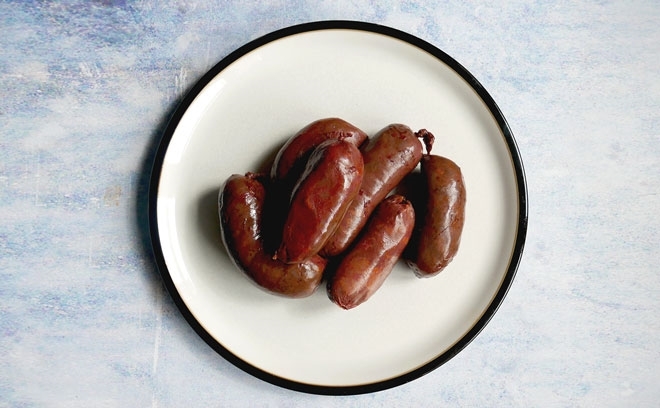 Also order some of your chipolata's and of course black pud, again delicious, best black pud I've found in England. Finally very well packaged for delivery and on time. A "hearty" beakfast! Couldn't resist, had my Valentine Breakfast in January. Fabulous. Say it with heart-shaped black pud. Splendid Black Pudding Had several packs of these last Christmas and plan to do the same again this year. The only trouble is making sure enough are left to make it to the table. Superb meat - best crackling ever Slow cooked this wonderful slab of meat with maple syrup, shredded root ginger, black pepper, chilli and garlic. The meat is so good that you don't have to worry about it drying out and the skin turns to wonderful crackling but unless you really overdo the heat doesn't burn. The flavour, tenderness and texture is just great. I'm very carniverous and eat all sorts of game, organic and free range meat, but this IS the best pork I've ever tasted and beats any other meat I've tried. Matt is a prince among pork producers and butchers. Bags of flavour This is the best black pudding I have tasted outside Spain. It's fruity and spicy and full of flavour. Lovely baked with rice and chickpeas. Simply the Best. Never before have I attempted to eat an entire log of Black Pudding until I tried this one. The magical blend of herbs and spices (something even The Colonel would be most proud of) that makes it most amazingly moorish and moist. Something about the fresh blood that creates a moorish mouthfeel of almost smoothness and perhaps even a haggisy hint... Doesn't need to be played around with in the kitchen, fry quickly to keep crisp and try not to eat the lot!! Black Pudding Add a few washed apples near end of cooking....LOVELY!!! Recommended ***** I didn't think they still made bacon like that!! Sausages are cracking as well. Olé! So happy to have found one of my favourite foods. Nice. Very nice.